Aimed at working players at all levels, this new amp is well priced and competitive. It’s a pity Fender chose not to give this amp a pine cabinet. There’s a well-known saying: “if something isn’t broken, don’t try to fix it”, and for 25 years Fender’s Blues and Hot Rod range of amplifiers have done a sterling job of holding market share in the highly competitive mid-priced amplification sector. In the early 1990s Fender’s amplification range was under growing pressure from the boutique market, which was spearheaded in the late 1980s by products like THD’s 4-10 and Kendrick’s 2410 combos; very high-quality remakes of classic Fender tweed amplifiers, utilising point-to-point hand wiring and pine cabinets with tweed (properly known as twill) cloth covering. At the time, rack-mania was in full swing and no self-respecting guitarist was without a stereo rig with a MIDI-powered preamp, multi-effects, power amp, foot controller and a stereo cabinet or two. Despite the endless tone variations, they proved frustrating and self-defeating for many players, who spent more time fiddling with parameters and presets than playing music. a return to simpler tools with a more direct connection, and Fender’s original Blues amplifiers provided exactly that, combining a familiar blend of tweed and Blackface-era cosmetic influences with a simple valve-powered design that incorporated modern features like channel switching and an effects loop. The Blues amplifiers were re-born in the second half of the 1990s as the Hot Rod range, with a gain boost feature and revised EQ. These have been in continuous production ever since, with occasional limited editions. A Mark III update in 2010 saw minor tweaks to the cosmetics and EQ, with a slightly more significant change from the stock Eminence loudspeaker to a Celestion G12P. Fast forward to today and it’s time for another update: three models from the new Mk IV range: the HR Blues Deluxe IV, the HR Blues DeVille IV, and a limited edition of the Pro Junior IV. Today, we’re focusing on the Pro Junior. The Pro Junior LTD’s cosmetics take a more vintage approach than its recently-released stablemates: although the cabinet is MDF this time, it’s covered in drool- inducing dark lacquered tweed, with a chrome control panel and a Jensen P10R Alnico loudspeaker. Behind the rear panels of all three of the new amps, the electronics sit in robust open-ended steel tray chassis, which are secured to the cabinet top and sides with substantial mushroom-head machine screws. The layout for all three amps is more or less the same: a large vertical single-sided PCB holding most of the small components including the panel knobs and switches, linked by ribbon cables to a more robust through-plated board sat horizontally in the bottom of the chassis, which holds the valve bases. Fender has stuck with this type of layout from the beginning and while it’s more than adequate, we’d be happier with through-plating on both boards and stranded hook-up wire replacing those ribbon connectors. Nevertheless, the build standard on all three amps will certainly stand up to long-term use. All three amps use 12AX7 preamp valves; for output power the Pro Junior has a pair of EL84s. The Pro Junior’s back-to-basics panel features a single input jack, feeding volume and tone controls. There’s no effects loop or channel switching; it’s a very simple design, with an emphasis on the most direct signal path between input jack and loudspeaker. Overall, all three amps look the business, with classic cabinet dimensions and styling inspired by Fender’s rich history. The Pro Junior IV’s simple circuit translates into a perfectly balanced clean sound that gradually adds rich, multi-layered overdrive colours as the volume is turned up, due in part to the excellent Jensen P10R speaker fitted to this limited-edition model. The volume control has been modified on the MkIV for a more gradual change between clean and dirty sounds, and in practice it’s much easier to dial in. Single coil guitars stay more or less polite up until around the halfway mark, with humbuckers breaking up a touch earlier. After this, the clarity gives way to a thick, compressed crunch that sounds great for rhythm and solos at low to medium volume, and is superb for recording, especially when teamed with the right microphones. Our favourite mic choice for small amps like the Pro Junior is Sennheiser’s iconic MD421, blended with an SM57. Tracks recorded with a dash of room reverb sound huge, with little or no EQ needed on the desk. Sonically the Pro Junior isn’t so easy to pin down, perhaps because of the EL84 output stage, which has its origins in Europe while Fender’s traditional fare for its smaller amps is the homegrown 6V6. The P10R Alnico driver delivers a sparkling treble and a warm but not excessively powerful midrange, giving it a little more in common with classic British amps than you might expect. 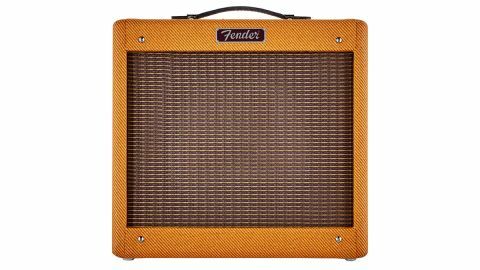 There’s a subtle irony here, as many British designs from the 60s owe at least some of their inspiration to Fender’s tweed family.